To get logged into the admin, go to the URL that should have been sent to you. 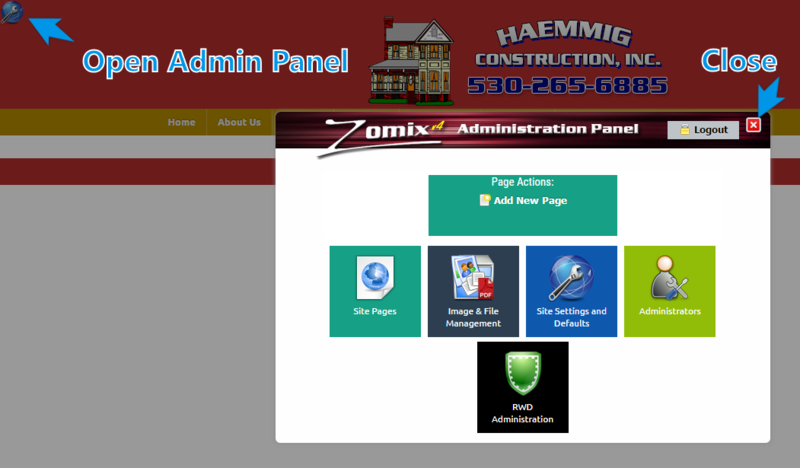 Login with the information provided and then You'll end up here, at the main Administration Panel. To return to the admin panel at any time, just click on the icon at the top left of the screen, as shown in the below screen shot. To start editing existing pages, simply navigate to the page you want to edit, like you normally would, but now that you're logged into the admin, you'll see some additional icons appear on your site. 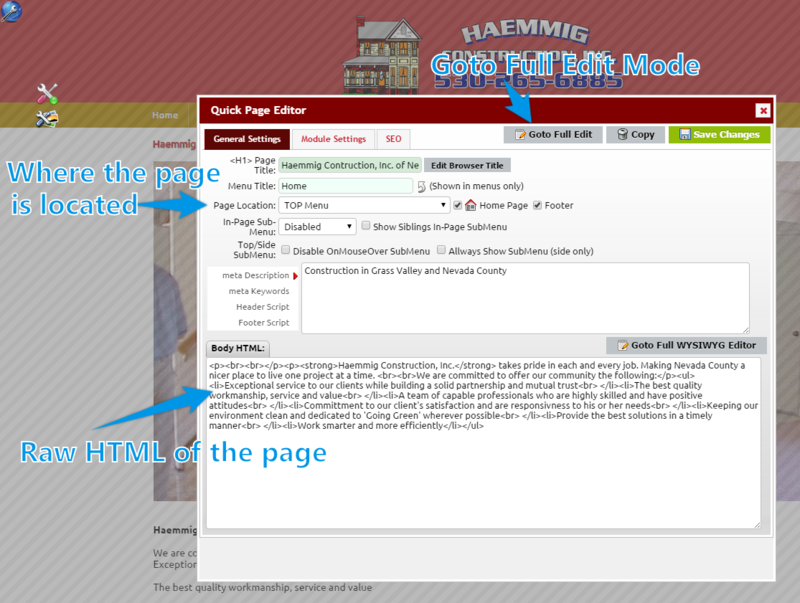 To edit the body content of your page, you can do that right inline in the page by just clicking where you want to edit. When you click on the body you'll see the Editor tool bar appear above the content of the page. You can edit everything here as normally would with one exception, the 'back-space' key will not work inline, as this has other browser functions. So instead use the arrow keys and the 'DEL' key to delete characters, or you can use your mouse and 'select' the content and then use the 'DEL' to remove it. If you click on the wrench and screwdriver icon or you'll get the 'Quick Page Edit' pop-up window. In this window you can edit the location of the page, along with it's name in the browser/title/menu. You can also set it's 'location' within the site. Any page can be moved to another section of the site by simply selecting a different 'location'. Locations are it's 'parent' location. Any page can have any number of children under it (sub-pages). Meta Data is also set here. Meta data is information that's stored behind the scenes for your search engines like Google, Bing and Yahoo etc. These are important to have, and be unique per-page. In the quick edit window you also have access to the settings for any modules that might be enabled on this page. 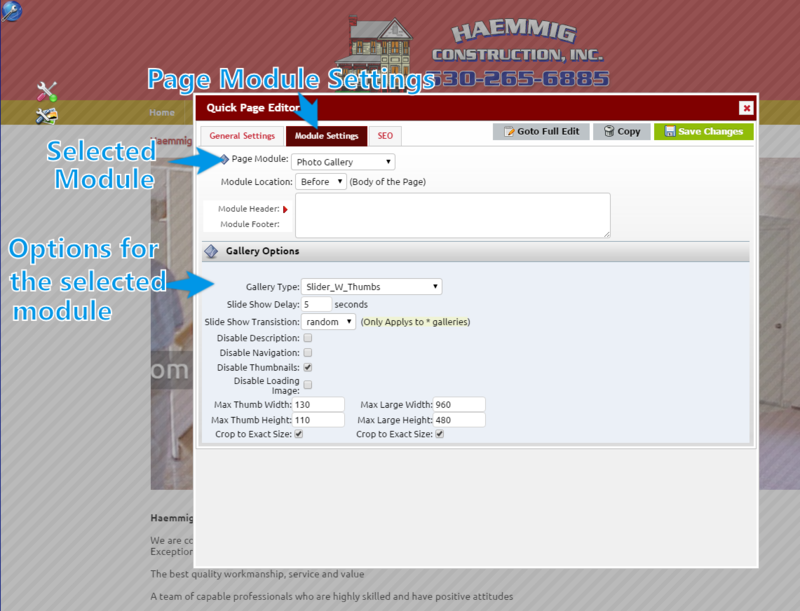 Here you can make adjustments to those settings or select a different module. 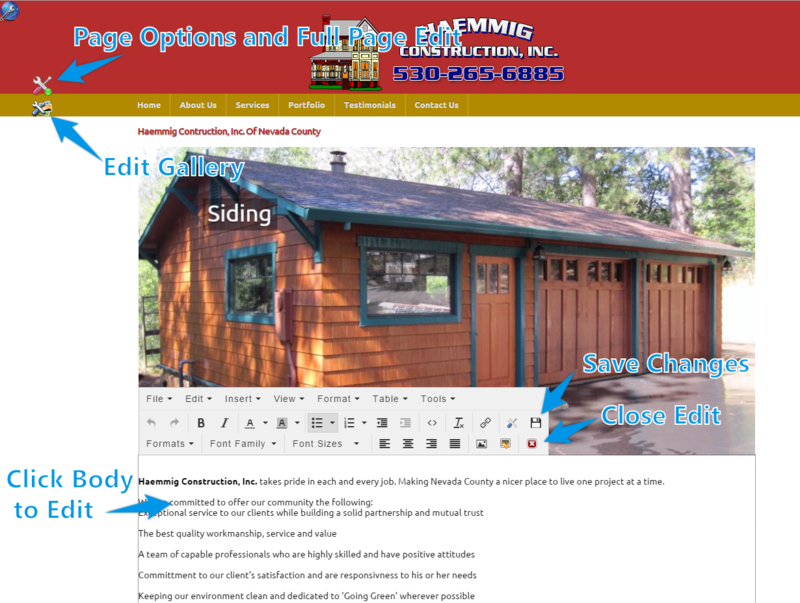 Clicking on the "Goto Full Edit" button located at the top of the quick Edit window, or in the 'File' pulldown of the inline editor, allows you to edit the page in a full screen view, in addition to allowing more advanced editing and options to be set for the page.